1 Wash the salad, mix and set aside. To prepare the smoked tomato coulis, sweat the onion, garlic and shallot in olive oil, then add the chopped tomato, sugar and herbs, and de-glaze with white wine. Add the stock and simmer for 45 minutes. Season to taste, then strain and add the chipotle sauce. 2 Make the pesto by rapidly blanching the basil leaves in boiling water, then puree in a food processor with the pine nuts, Parmesan and olive oil. 3 For the soufflés, first put the cream and half the Parmesan in a casserole dish, and bake at 350F/180C for 8 minutes. 4 Next, make a béchamel (white sauce) by melting the butter, gently frying the flour for just under a minute, then gradually whisking in the milk. Simmer gently for two minutes, stirring all the time, until thickened and glossy. 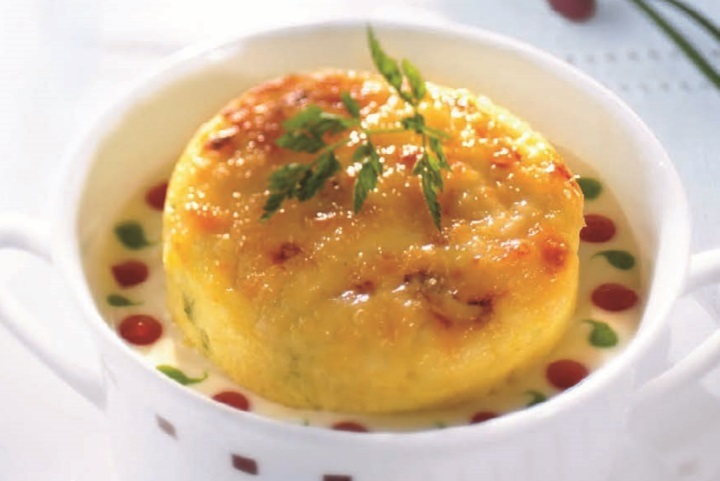 When cool, mix in the mashed goat’s cheese, the remaining Parmesan, the chives and parsley, and fold in the egg yolks. 5 Beat the egg whites until they are nearly peaked, then fold into the béchamel. 6 Butter four ramekins and spoon in the mixture.Then bake at 250F/130C for 20 minutes. 7 To serve, place the white sauce in the centre of the bowls and the soufflés on top. garnish with tossed micro greens.